The book business is divided between two divergent yet synergistic entities: art and commerce. As authors, our stories are imaginatively composed, subjectively appreciated, and diversely interpreted. These qualities don’t particularly abide by Wall Street rules, but to make writing a vocation, the work cannot exist in a void. Whether we like it or not, there is a parallel corporate track to literature that has existed long before any of us. It’s not to be feared but to be embraced as part of the organic ebb and flow of literary dissemination. Through the ages, the business of publishing the written word has proven itself a fundamental part of every progressive society, and it requires expert tradespeople. Enter the heroic bookseller. The bookseller is the fulcrum on which the reader-author/buyer-seller/consumer-creator relationship functions effectively. Understanding how we, as writers, can aid their work only improves the dynamics between us and helps the literary community flourish further. So in an effort to learn more, I’ve invited one of my favorite people to Writer Unboxed. It’s with great pleasure that I introduce Beth Seufer Buss, the brilliant community outreach manager of Bookmarks in North Carolina. Welcome Beth! Let’s chat about being a bookseller. What’s your role and what do you enjoy most about it? Beth Seufer Buss: There are many incredible things about my job, but one of the things I treasure the most is helping readers connect with books and authors, which is part of the Bookmarks’ nonprofit mission. Being able to help readers find themselves in books, learn about a new culture, or escape to a new adventure is a privilege and something I hope I never take for granted. This summer we had a mother and son (let’s call him Tony) visit Bookmarks. Tony didn’t seem thrilled to be there and told me flat out he didn’t like reading. The one book he came to the store to get wasn’t due to be published until later that month, only adding to his frustration. We talked about different books, and he reluctantly agreed to try ARU SHAH AND THE END OF TIME by Roshani Chokshi. Fast forward to two weeks later, when Tony and his mother returned to the bookstore — he was radiant! He wanted to tell us how much he loved Aru, look for more books, and even had his picture taken in front of the store. They returned for our one-year birthday party and our Scholastic Summer Reading Road Trip event, and to quote Tony’s mom, “we’ve created a monster.” Those moments are absolutely magical to me! How do you feel about the way technology is affecting book readership and book purchasing? Beth Seufer Buss: One of the things technology has done is make it far easier for people to connect with others. Social media allows readers to connect with and follow their favorite authors, stay on top of big news from the book industry, discover new and diverse authors, and interact with other readers. Podcasts are an increasingly great way to keep up with book news and reviews, genres, analysis, writing, and more. It’s a wonderful time to be a reader! Technology is also responsible for giving us books in new formats, particularly audiobooks and ebooks. I’m a big fan of audiobooks because they allow me to sneak reading into parts of my day like walking to work or cooking dinner. I always travel with at least one print book, I still load up my iPad with ebooks because it’s much more convenient and cheaper than packing a separate suitcase for my books. If listening to audiobooks or reading an ebook is way somebody prefers to read, I fully support that and am grateful to companies like Libro.fm and Kobo that provide audiobooks and ebooks that support independent bookstores. It’s easier than ever to find and connect with local bookstores thanks to technology. You can visit IndieBound.org to find local independent bookstores in your area – or on your vacation route, which is always a fun way to break up travel. Once you connect with your local indie, you can sign up for their newsletter, learn about their upcoming events, connect on social media, and order/pre-order books via their website. Surveys continue to show that although technology is convenient, print books remain much more popular than e-books. Although technology provides convenience, print books give us a break from the technology and distractions in our daily lives. Many of us spend the majority of the day in front of computers and devices, and print books provide the escape so many of us crave from our devices while also allowing us to escape into a completely different place and time. What does a brick and mortar store offer patrons that they can’t get from an online retailer? Beth Seufer Buss: Oh, where to start? Although every independent bookstore has its own unique personality, they are all warm and welcoming thanks to the people who work there. We refer to Bookmarks as our home for the literary arts, and I think of it as my second home. Working at a bookstore is so much more than stocking books and ringing up transactions; it is about making personal connections, talking to people about what’s going on in their lives, having passionate conversations about books and issues, and forging genuine connections. It’s almost a complete 180 from the online environment. Online algorithms might recommend additional books to purchase, but they aren’t a substitute for the conversations that lead to personal recommendations from booksellers you know and trust. There are so many factors to choosing a book beyond what you’ve ordered before and as readers we may not even realize it until we’ve having that conversation with a bookseller. What are you in the mood to read? Do you want something similar to what you just read or completely different? I can’t tell you how many new favorites I’ve found simply by wandering the shelves of a bookstore looking at displays, reading shelf talkers, and browsing staff picks (one of my favorite sections of any bookstore). They say you can’t judge a book by its cover, but we all do, and the serendipity of finding just the right book by browsing the shelves and actually seeing books you can pick up and sample is priceless. Beyond recommendations, brick and mortar stores offer the full book experience. You might be able to chat with an author online, but in a bookstore you can meet the author, hear them read from their book, ask them questions, buy a copy of the book and go home with a signed, personalized copy. You didn’t just buy a book, you had an experience and made a memory. There are so many opportunities for making memories in a bookstore: storytime, illustrator workshops, book clubs, teen advisory councils, book trivia, launch parties, festivals, parapaloozas, panels, you name bookish fun, and it’s happening at a bookstore! There’s a connection that’s made when you come in a bookstore and have conversations with booksellers, authors, and fellow readers. Bookstores are safe places to explore new ideas, discuss difficult topics and issues, or find an escape from the world around us. They allow you to become part of and support your community – shopping at independent bookstores helps keeps tax dollars in your community, create jobs, help the environment, invest in entrepreneurship and small business, and so much more! Apart from the actual selling of hard copy books, what other activities do modern booksellers participate in? Beth Seufer Buss: So many things! During the interview process at Bookmarks we go through a long list of responsibilities because so much of being a bookseller is stepping out from behind the cash register and engaging with our community. We are constantly looking for new ways to connect with the local community, and many of those relationships have started as a result of conversations within the bookstore. As you might expect, there’s a lot that goes on with the actual books themselves. We receive daily shipments books that need to be unboxed, received into our system and shelved in the store. What people may not realize is there’s no time for actual reading at the store – when we have a quiet moment between customers, we’re working on recommendations, writing staff picks, creating and maintaining displays, updating chalkboard signs, straightening and cleaning the store, and working on other special projects. Booksellers also help with the wide range of events we have in the store. They read at story time, lead a book club discussion, and give bookstore tours to visiting school groups. When we have an author event, they serve as event host, coordinating store and technology setup, introduce the author, photograph the event, coordinate the book signing, then take it all down and put the store back together again. There are some not-so-glamorous tasks like taking out the trash and recycling, dusting and vacuuming the store, and other housekeeping items, but it all contributes to keeping the space looking organized and ready for our guests! One of the fun benefits of bookseller life is that publishers send us advanced reading copies (ARCs) and advanced listening copies (ALCs) for books that haven’t been published yet. It’s exciting to be one of the first to read a forthcoming book by a debut novelist or have early access to a long-awaited sequel by one of your favorite authors! In return, we write and share reviews with publishers and the book industry and get a feel for what books we want to carry and recommend in the store that season. What can authors do to help promote events hosted by bookstores? Beth Seufer Buss: We appreciate anything and everything authors to do help promote events! First and foremost, share information about the event early and often – let your followers know where they can see you and how to get in touch with the bookstore if they have questions about the event. If you’re putting together promotional materials or listing events on your website, list the bookstore name in addition to the city and town. Tag the bookstore in your social media posts, and as much as you’re able to, interact when the store promotes your event on social media – retweet, repost, comment, like, and be involved in the conversations surrounding the event. Letting your followers know how excited you are to visit a bookstore in their area will help get readers excited! Encourage people to pre-order and buy their books from the store(s) where you’ll be having your events! Independent booksellers are fierce champions – we will be recommending your books and talking about your event long after your event is over! What are some creative ways authors can become involved with events at the store between new book releases? Scenario 1: You’re a writer whose first book is about to be published, and you’ve been inundated with requests for interviews. In the dim and distant days before blogs and online magazines, that meant someone calling you, or goodness, even coming to visit you in person and recording the interview on a little machine. These days, though, the approach is usually made through email, and unless it’s a piece for your local paper (and even then perhaps!) the interview will most likely be conducted in the same medium, and published online. It’s likely you will never meet the interviewer and so you have to impress and interest them purely through the written word. Well, that’s easy, isn’t it? You are a writer after all! And then you get that first interview-and you freeze. Talking too much—or not enough—revealing too much—or revealing too little—striking the right tone—treading a fine line between spontaneity and reflection—showing confidence but not being too pushy: so many things to think about, so much to get right (or wrong). Author interviews are a fact of the writing life. Whether as interviewee or as interviewer, every author will inevitably have to gain some experience of the art and craft of author interviews. So how do you go about getting that experience? 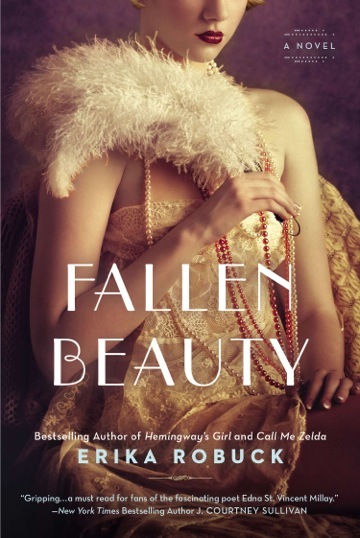 Erika Robuck, long-time contributor to Writer Unboxed, recently released her fourth novel Fallen Beauty. Erika also writes about and reviews historical fiction at her blog, Muse. We’re very pleased to have her here today to tell us more about her newest novel! ER: In Fallen Beauty a poor, small town seamstress, ostracized for her past, is commissioned to create a reading tour wardrobe for the scandalous poet, Edna St. Vincent Millay. Doing so would require a betrayal of her family because of a secret, and risking the reputation she struggles to rebuild, but not doing so could mean that she loses everything. ER: Fallen Beauty is a novel of contrasts: dark and light, winter and summer, the “duende” and the Muse. It is about what it means to be a perfect woman, if there is such a thing, and how we break each other with our judgments, which are often the very things we hate about ourselves. Q: What do your characters have to overcome in this story? What challenges do you set before them? ER: My characters think they have to overcome the judgments of a small town on their lifestyle choices, but are confronted with the painful realization that their own self-loathing is the greatest burden to bear. ER: For the first time in writing about writers, I decided to take on the voice of my subject, Edna St. Vincent Millay, as a point of view character. I did not think I could rise to the challenge of this intensely dark, often savage, and deeply poetic woman, and nearly abandoned the idea midway through writing the novel, in favor of telling the entire story through my protagonist.